Who makes the best cupcake in DC? 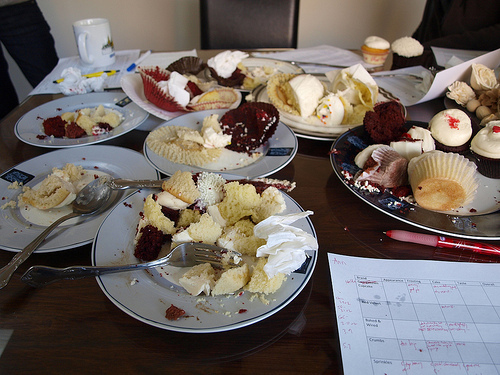 There’s nothing like a massive cupcake taste-off to help you visualize yourself in that projectile puking scene from Stand By Me–with cake vomit standing in for pie vomit, in this case. This shot was taken before disgusting amounts of cupcake consumption commenced. Photos by Ms. Pie. Last weekend, Ms. Pie, Mr. x-sXe, Greenie, Token Vegan and I set out to determine who makes the best cupcake in DC. 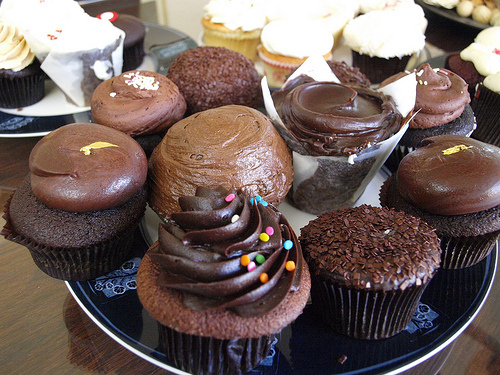 According to The Washington Post cupcake wars from 2008, the winner was the chocolate ganache from Georgetown Cupcake. Since then, quite a few more cupcakeries have cropped up around town, so it was time for a re-match. 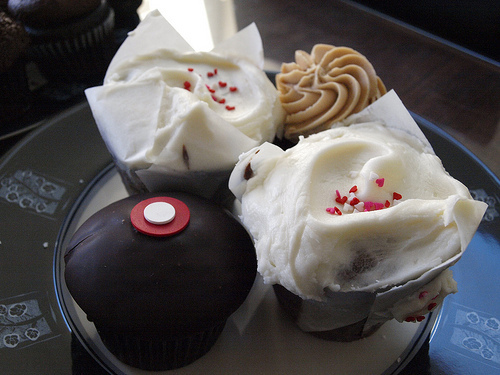 The red velvet contenders, clockwise from 5 o'clock: Sticky Fingers, Sprinkles, Georgetown Cupcake, Crumbs. Aside: If you want to take all the pleasure, joy, and fun out of cupcaking, try tasting 30+ cupcakes between 4.5 people (the .5 being Token Vegan) over the course of 3 hours. While OD’ing on cupcakes like this may put most people off cupcakes for the foreseeable future, I was hitting the freezer for leftovers within 24 hours. Appalling but true. 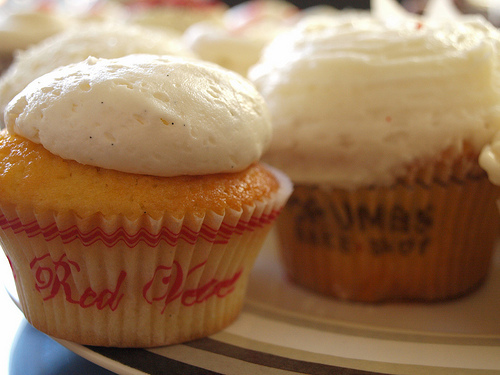 Appearance-wise, Red Velvet Cupcakery's cupcakes are the woman grocery shopping in sweatpants. The Methodology: We pitted 7 DC bakeries/cupcake shops against one another. Asterisks indicate national chains. We taste-tested 3 mainstay flavors side-by-side: red velvet, chocolate-on-chocolate, and vanilla-on-vanilla. Hello Cupcake doesn’t do a red velvet, and Baked & Wired was out of that flavor the day we went, sadly. The chocolate contenders, clockwise from 6 o'clock: Hello Cupcake, Red Velvet Cupcakery, Sticky Fingers, Georgetown Cupcake, Baked & Wired (in parchment), Crumbs. 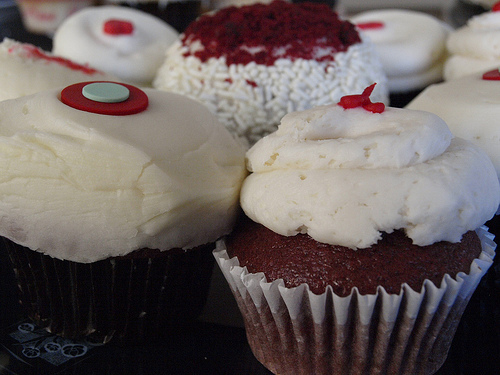 Red Velvet: Sprinkles. Score: 7.75. The cream cheese icing was exactly the way you’d want it to taste–the tangyness comes through, perfectly paired with a fluffy, moist cake. Crumbs took second place with 6.25. Chocolate-on-chocolate: Baked & Wired. Score: 7.25. The chocolate icing is a creamy consistency (did I detect a hint of coffee in there?) atop a dense cake with a hefty crumb. Sprinkles wasn’t far behind, with a score of 7. Note that we tested the dark chocolate from Sprinkles, which some taste-testers found “too rich.” And while Ms. Pie noted that “Hello Cupcake’s chocolate cupcake is like the Platonic ideal of what a cupcake should be,” they tied for third with Crumbs at 5.25. Vanilla-on-vanilla: Baked & Wired. Score: 7.25. Crumbs was second, with 6.25. Overall we were most underwhelmed by the vanillas. Maybe that’s why the word vanilla is used as an insult? 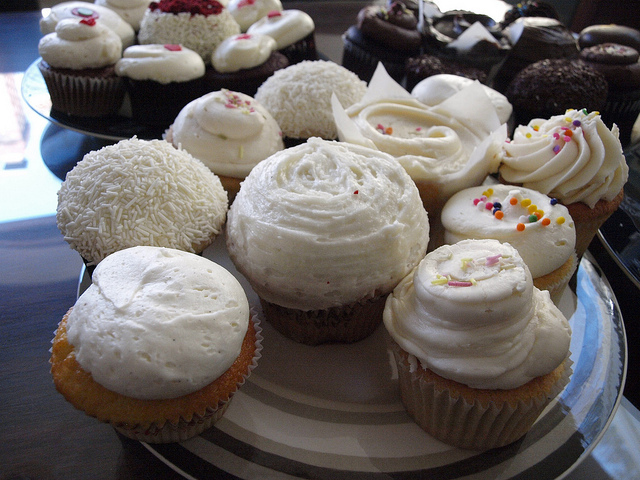 But we also tasted them last, giving them an unfair disadvantage, since we were ready to swear off cupcakes by then. The aftermath. By this point we were feeling very, very ill. In conclusion: the best overall cupcake in DC is the red velvet from Sprinkles, but the best bakery overall is Baked & Wired. They also offer the best value, with cupcakes weighing in at 5.7 oz. ($3.50)–or as Ms. Pie puts it, “the Quarter Pounder of cupcakes.” To put that into perspective, a Georgetown cupcake ($2.75) weighs around 2 oz. Sticky Fingers, a recent Cupcake Wars winner, was disappointing considering their big victory, although Ms. Pie is rallying for them to bring back their flower cupcakes. 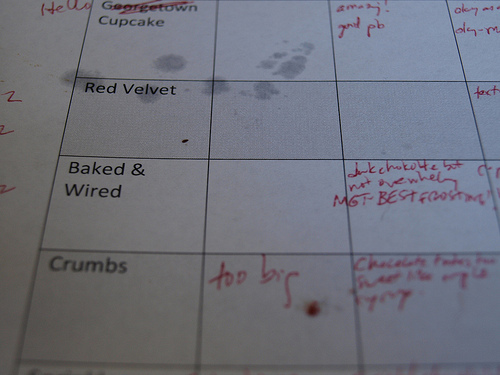 Their scores were consistently at the bottom along with Red Velvet Cupcakery (“frosting like a stick of butter”). I have to applaud you for your selfless sacrifice in this matter. (Not to overstate it, but how else could it be named?) You have done a true service to your country.